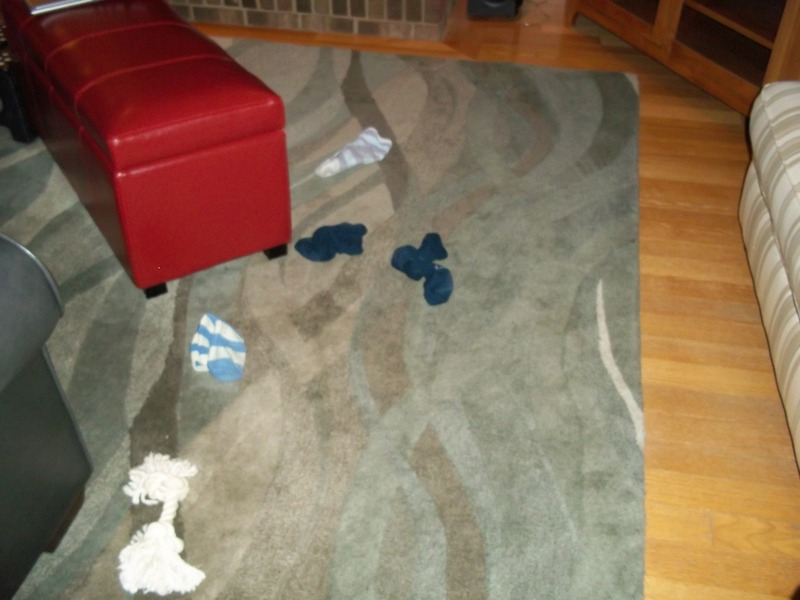 I’ve been finding socks in my living room. Sometimes it’s a dirty sock that didn’t make it to the hamper and sometimes it’s a pair of clean socks taken from the sock cubby in my closet. In addition to being a digger, Louie apparently has some herding instincts. Did my socks just walk into the living room? Sometimes he would even drag the snowman draft stopper at the front door into his pile. It took me several days to catch him in the act with a sock in his mouth and all I did was laugh at him and gave him a half-hearted “no.” I’ve yet to catch him with the snowman and that has bells on it. He’s a crafty little bugger! He does attack the sock to keep in shape for whatever critters he might find in the backyard. His friend Penny gave him a bed and he drags it around the bedroom. It’s a small bed and I had planned on putting it in the room I use as the office, but Louie showed so much interest in it, I tossed it beside his other bed in the bedroom. He curls up tight and sleeps in it some nights; although, most nights he still sleeps on the ottoman in the living room. 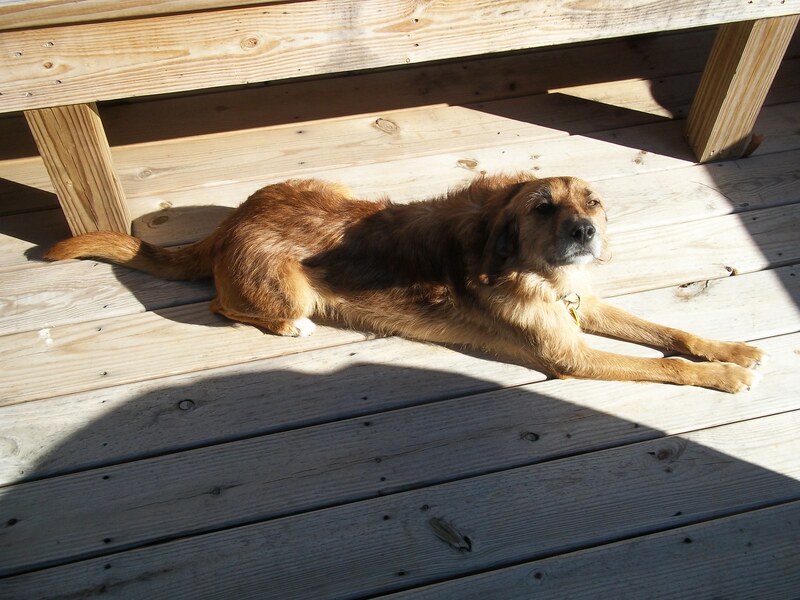 Catching some rays on a cold day! Yesterday was cold here in Cackalakey but Louie enjoyed some time on the deck. He’s getting more comfortable in the backyard and has started running laps just for the sake of running the way Zoe did. Even though we go for a 20-30 minute walk every day I was a little concerned that he wasn’t getting enough exercise. Without proper exercise, what is now a charming little habit of herding socks could turn into chewing furniture. But so far, so good. 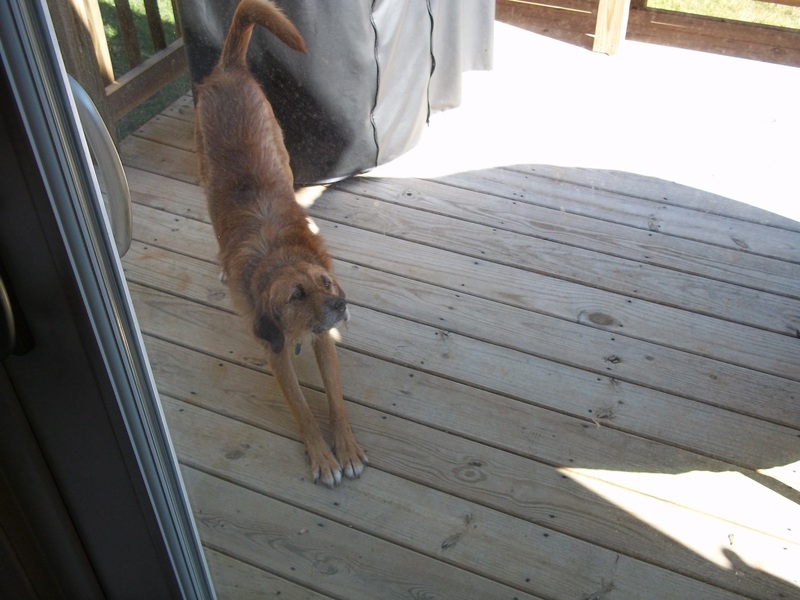 Louie is also a big fan of stretching will hold his downward facing dog pose for upwards of 10 seconds before swinging into upward facing dog. He’s quite Zen. He also reminds me of the importance of stretching throughout the day and quite frankly, it’s hard to find something that beats a good stretch. Louie is a good influence on me, he makes me walk everyday regardless of the weather. A couple of days it was a quick 15 minute walk due to the weather, but we’ve walked every day that he’s been here. Actually, today is our first monthaversary! He came to Shoeful of Drool on 12/19. I guess I’ll have to fix something special for supper. My sock herder is very different from Dudley and Zoe, but I think they are smiling. 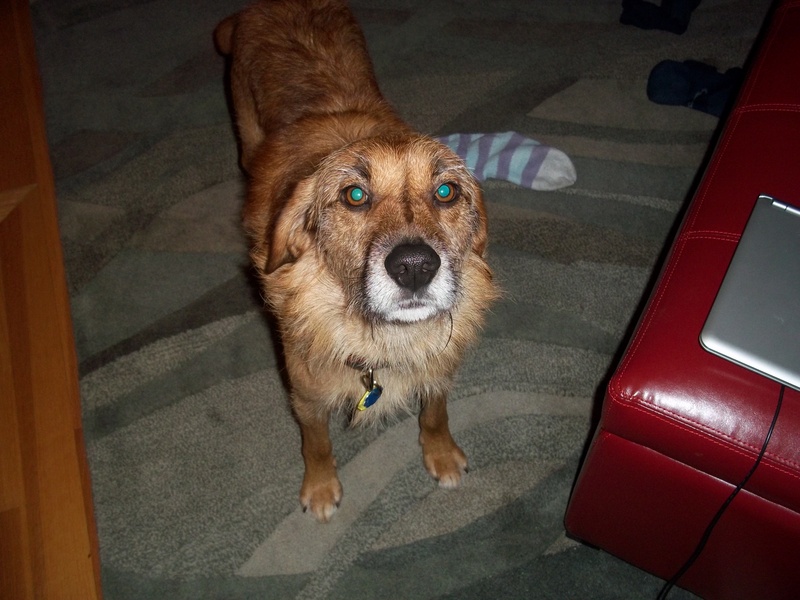 This entry was posted in Uncategorized and tagged animals, canine, dogs, Louie, walking. Bookmark the permalink. I had a few pair under my chin as I put away laundry yesterday, but not in my mouth.